There’s no dearth of kulfi stalls in Delhi. Every neighbourhood is bound to have a shop offering a tempting range of kulfis to help you quench your thirst and give you the much needed sugar dose in the summer months. So it is saying something when you find yourself heading out all the way to the heart of Old Delhi in the scorching heat to savour this Indian ice cream in the most basic of all stalls. Yes, that’s the power of Kuremal Mohan Lal Kulfi Wale and its lineage of soul-nourishing kulfis. Made with 100% natural ingredients, having their kulfis is like indulging in fresh fruits – the flavours are so real unlike most commercialised brands.The story goes that in the early 1900s, Mr. Kuremal came up with the bright idea of selling kulfis to the residents of Chawri Bazaar. He set up a small stall with nothing but a big matka full of the creamy dessert in one of the narrow by-lanes. At that time, the only mode of refrigeration was an earthen pot filled with ice slabs. He had on offer two varieties of kulfi – plain doodh and kesar pista, and found himself doing good business as talks of his kulfis spread near about. 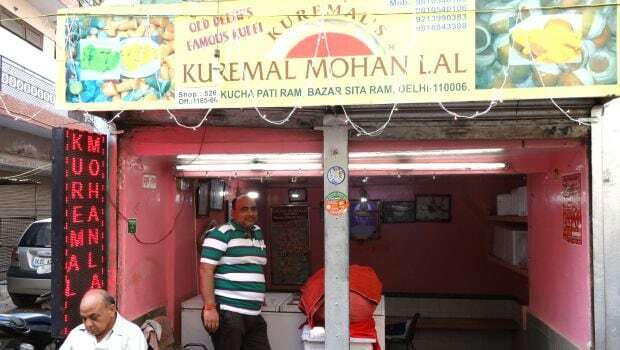 His son Mohan Lal then took on the business and tried to expand the range of kulfis and introduced what he never thought would be the reason for their family stall to be listed as an iconic eatery in Delhi in the years to come – the stuffed kulfi. 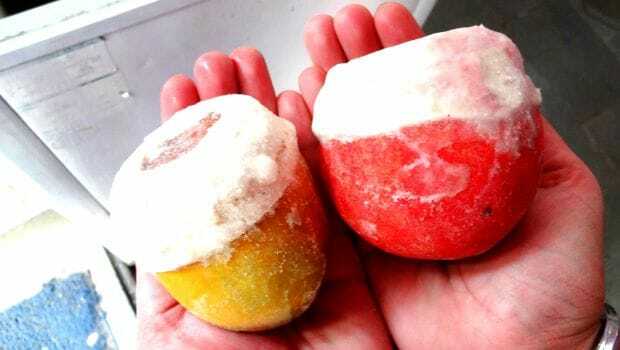 The stuffed kulfi is a real fruit, the pulp of which is used in the making of the kulfi, and the content is then added back into the fruit and set. 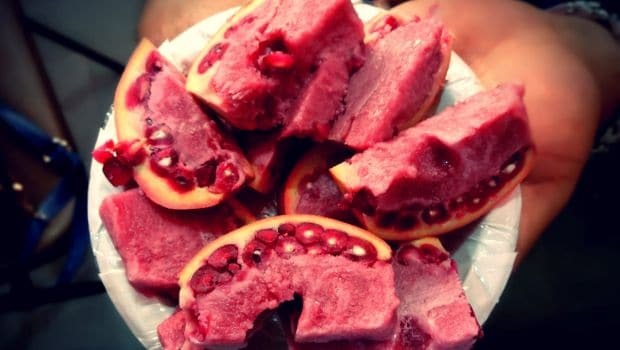 As you take your pick from their limited range – apple, pomegranate, orange, mango – the server cuts open the fruit and plates out slices of the fruit kulfi. The milky treat is sugary, from the added sugar, but you also get to relish the fruity notes. Mr. Anil, the fourth generation from the Kuremal lineage, tells us that they can make stuffed kulfis from all sorts of fruits, including whole pineapples, but those are mostly done on order. In fact majority of their income comes from catering and bulk orders. Though we visited the stall to get a taste of the iconic stuffed kulfi, it was another variety of kulfi that caught our attention. 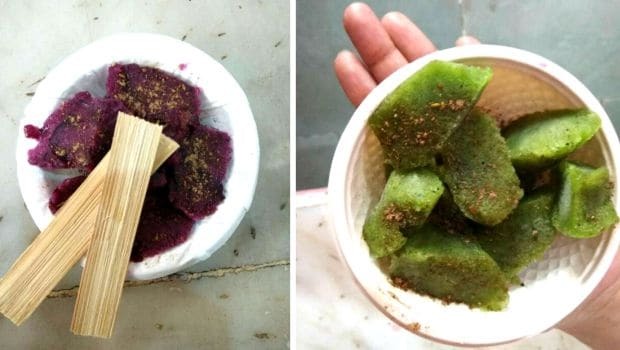 Resembling modern day sorbet, the milk-free kulfis, which they call ‘Kulfi Julpeps’, is a lip-smacking iced treat, served with a generous sprinkling of chaat masala on top. It is khatta and meetha, and immensely hard to resist biting into. The best part is that it comes without added sugar and you can taste the true flavour of the fruit instantly. They have a wide range on offer, such as kala khatta, jamun, aam panna, imli, guava, kiwi, litchi, chickoo, among others. 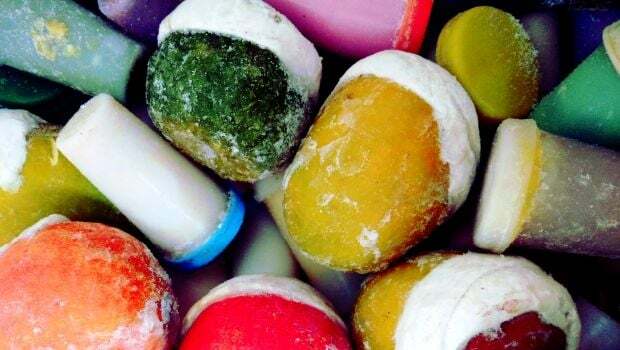 If you prefer milky kulfis instead, you can try their range of rabri kulfi available in interesting flavours – fruit cream, paan, gulab, gulkand, khajjur, and fig to name a few. They also offer matka kulfi, which comes in only one option – kesar pista. Finding the tiny stall is not difficult at all, thanks to Google maps. It is very close to the Chawri Bazaar Metro station. Just in case you are lost or overwhelmed by the hustle and bustle, just ask the rickshaw walas for Kuremal Kulfi Wale and they will take you right in front of the stall, which is basic no doubt, but then again, it’s the flavour that matters more than anything else and you are sure to find yourself craving for more.